In 2016, eight fatalities involved dogs from two or more different breeds, thus producing a death count total of 41 rather than 31. Two dog breeds each contributed to one death, including: Australian cattle dog and shar pei. The unreleased breed data includes a family dog that killed an infant and a pack of dogs that killed a 58-year old man. Together, pit bulls (22) and rottweilers (2), the second most lethal dog breed, accounted for 77% of the total recorded deaths in 2016. This same combination also accounted for 76% of all fatal attacks during the 12-year period of 2005 to 2016. The breakdown between these two breeds is substantial over this 12-year period. 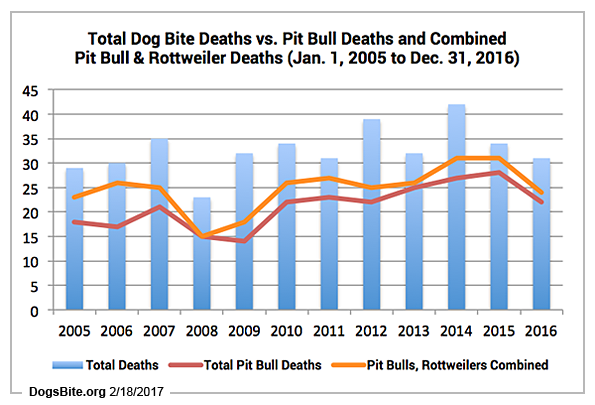 From 2005 to 2016, pit bulls killed 254 Americans, about one citizen every 17 days, versus rottweilers, which killed 43, a citizen every 102 days (Related graph). In 2016, the combination of pit bulls (22), their close cousins, American bulldogs (2), and rottweilers (2) contributed to 84% (26) of all dog bite-related fatalities. 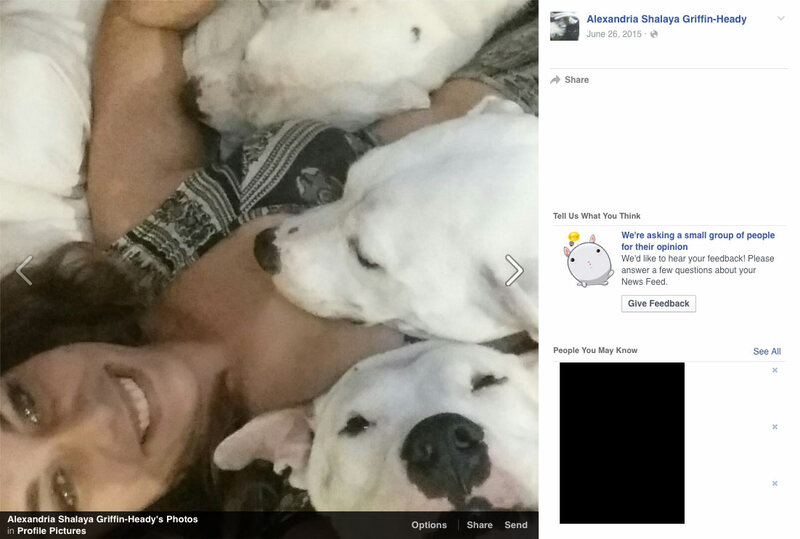 Both American bulldog cases involved dogs acquired in Miami-Dade County, Florida. Labradors and their mixes contributed to 3 deaths in 2016, followed by 6 breeds, each with 2 deaths: American bulldog, Belgian malinois, doberman pinscher, German shepherd, mixed-breed, rottweiler and 2 cases with unreleased breed data. Annual data from 2016 shows that 42% (13) of the fatality victims were children ages 9-years and younger and 58% (18) were adults, ages 30-years and older. Of the total adults killed by canines in 2016, pit bulls were responsible for 67% (12). In 2016, female victims (16) were greater in number than male victims (15). Among children ages 9-years and younger, male deaths were greater, 62% vs. 38% and among adults 59-years and older, female deaths outpaced males, 75% vs. 25%. In 2016, infants 3 to 6-days old accounted for 31% of all child deaths. 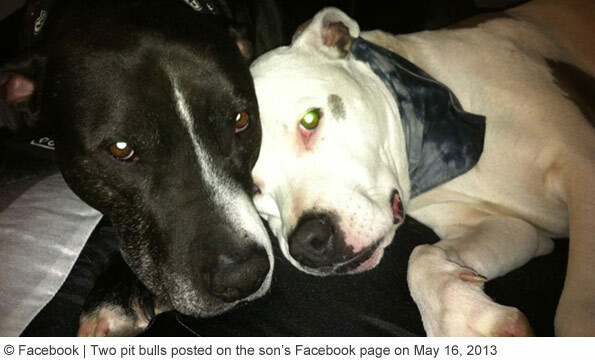 In one case, a pit bull-mix was lying in bed with the baby and its parents when it attacked. 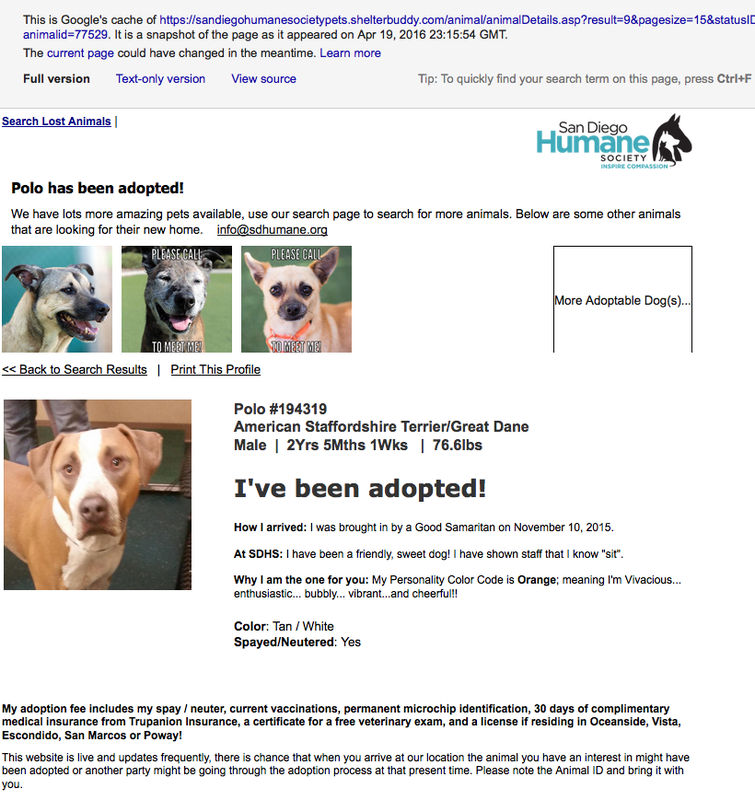 The family had adopted the dog 5-months earlier from the San Diego Humane Society. 42% (13) of all dog bite fatality victims in 2016 were either visiting or living temporarily with the dog's owner when the fatal attack occurred, up from 32% in 2015. 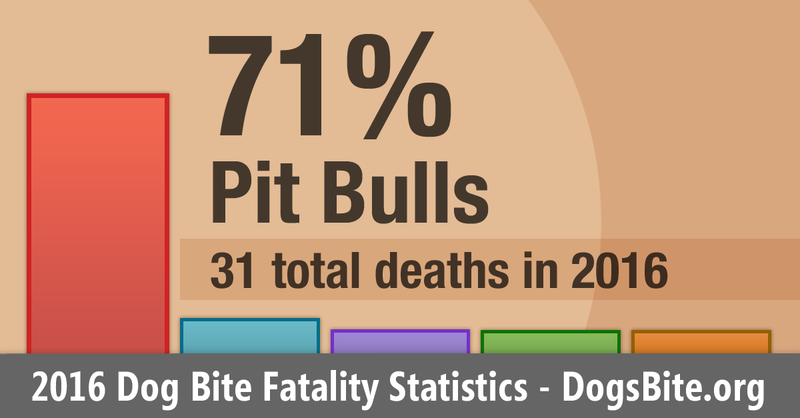 Of this subset of 13 fatalities, 77% (10) were inflicted by pit bulls. In 2016, 32% (10) of attacks resulting in death involved a dog or person new to a household (0-2 month period). Children 9-years and younger accounted for 80% (8) of these deaths. 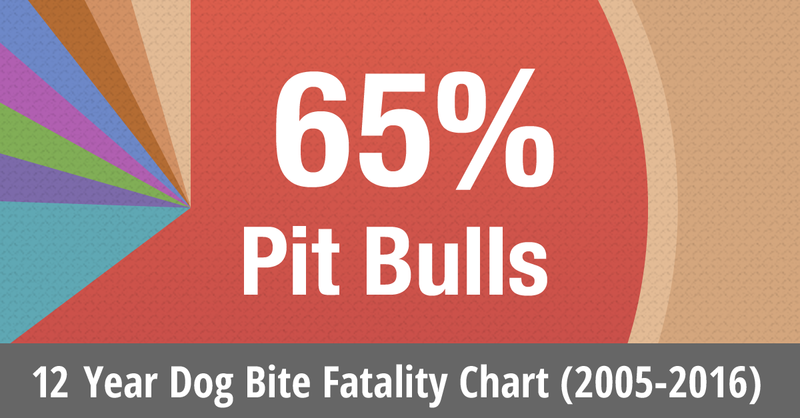 Of this subset of 10 fatalities, 70% (7) were inflicted by pit bulls. In 2016, 61% (19) of all fatalities involved more than one dog, up from the 11-year average of 44% (2005 to 2015). 35% (11) of all deaths involved 2 or 3 dogs and 26% (8) involved a pack attack of 4 or more dogs, up from the 11-year average of 14%. 29% (9) of all dog bite fatalities in 2016 involved breeding on the dog owner's property either actively or in the recent past; pit bulls accounted for 67% of these deaths. 3% (1) involved tethered dogs, down from the 11-year average of 10%. Dog ownership information for 2016 shows that non-family dogs inflicted the majority of deaths, 55% (17). Of this subset, 59% (10) were inflicted by pit bulls. 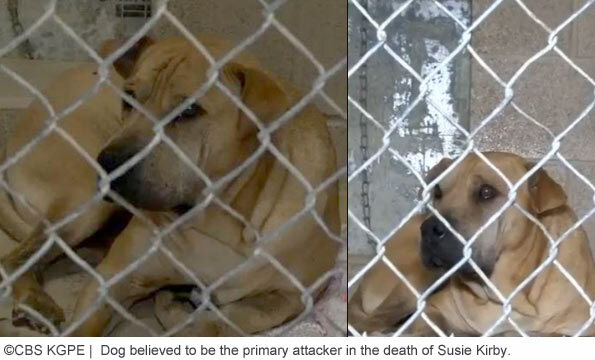 Conversely, only 19% (6) of attacks resulting in death occurred off the dog owner's property. Family dogs inflicted 45% (14) of all deaths in 2016; family pit bulls accounted for 86% (12) of these deaths, up from an 11-year average of 63%. Of the 22 fatal pit bull attacks, 55% (12) involved a family or household member vs. 45% (10) non-family. In 2016, only 6% (2) of all deadly attacks resulted in meaningful criminal charges; the lowest level on record.4 2016 also marked the first time a police officer's "personal" attack-trained K-9 killed a person; he was charged with two felonies. California led all states in fatal attacks in 2016 incurring 6 deaths; 67% of these deaths were inflicted by pit bulls. Florida, North Carolina and Texas each followed with 3 deaths. South Carolina, a routine dog bite fatality state, incurred no deaths. Change log: In early 2019, during the criminal trial of former police officer Alex Geiger, we "once again" removed the second dog, a German shepherd, after it was determined not to have attacked either victim. During 2017, several clarifications were made after we released our annual statistical data on February 21, 2017. 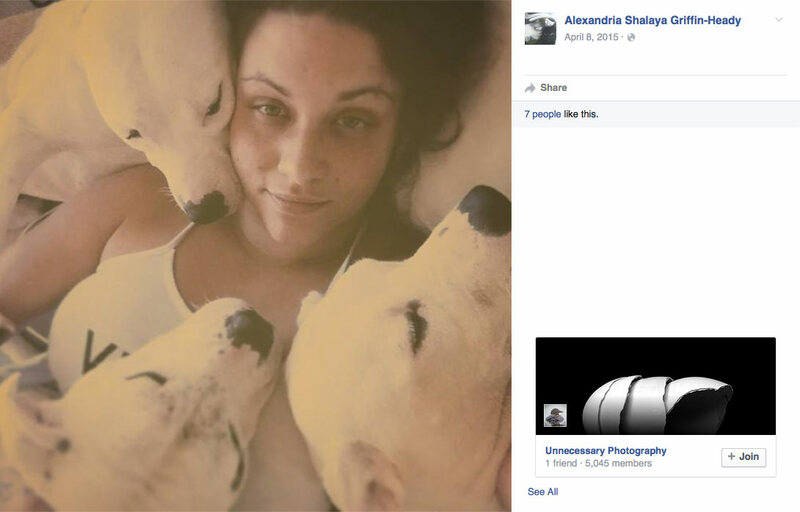 Police finally released the breeds of dogs involved in the April 14, 2016 death of Valente Lopez Aguirre (the dogs had been classified as "unknown" previously) and clarifications of the breeds of dogs that killed Daisie Bradshaw were made. Currently, our annual 2016 statistics do not yet reflect these changes, but they are reflected in our ongoing combined year fatality statistical data (from January 1, 2005 to present). We typically reissue single year statistics 3 or 4 years after its initial release due to the time length involved in criminal investigations and DNA testing, as well as our detecting non-media reported fatal dog maulings from recent past years in ongoing FOIA requests. 2016 survey: List of top 5 U.S. dog breed types ousts pit bulls by Merritt Clifton, Animals 24-7, July 29, 2016 (animals24-7.org). The most recent calculation by the nonprofit was completed in July 2016. Breed populations are determined annually by searching classified ad listings of dogs for sale and adoption. Data from 783,645 classified ads, each representing an individual dog, were used in their seventh annual survey. The last 3-year average of the total pit bull population from their surveys is 6% (6.7% in 2014, 6.6% in 2015 and 4.9% in 2016) and the 7-year cumulative average is 5.2%. As of the publication of these statistics on February 21, 2017. There were two male dogs and two females. 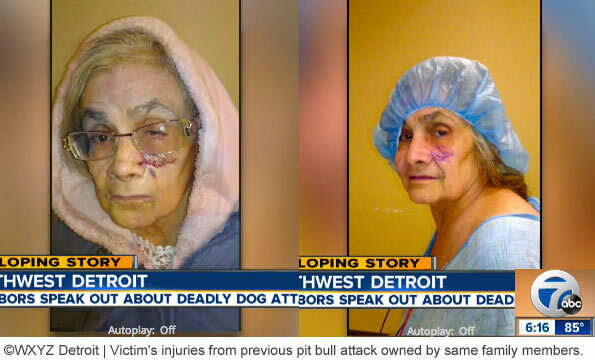 One of the female dogs was pregnant at the time of the attack. Otherwise, no other information was provided about spay or neuter status.